“Murphyism The Book: Whatever Can Go Right Will!” from Christian Faith Publishing author Keith Murphy provides readers clear instruction to achieving a long-lasting relationship and marital success. By revealing to readers the role of men and women in relationships, readers will learn to achieve a relationship continuum that can seamlessly transition into marriage. “Murphyism The Book: Whatever Can Go Right Will!”: a guide to finding the right marriage partner and achieving a successful transition to marriage. “Murphyism The Book: Whatever Can Go Right Will!” is the creation of published author, Keith Murphy, a champion of women. Published by Christian Faith Publishing, Keith Murphy’s new book is a guide for those transitioning to marriage and those struggling from a fragmented transition to married life. When transitioning from dating to marriage, people often experience a sudden change in lifestyle, which can leave any relationship in a fragmented state. Marriage must be the natural progression of a seamless relationship continuum. To achieve this relationship continuum and build a prosperous marriage, couples must start by understanding the role of man and woman in their relationships. Finding the right partner in life is one of the most important decisions someone can make. The information found within the pages of “Murphyism The Book: Whatever Can Go Right Will!” is absolutely essential to those looking for a partner. Author Keith Murphy gives readers clear instruction with humorous examples that will help them wisely search for a life partner. View a synopsis of “Murphyism The Book: Whatever Can Go Right Will!” on YouTube. Consumers can purchase “Murphyism The Book: Whatever Can Go Right Will!” at traditional brick & mortar bookstores, or online at Amazon.com, Apple iTunes store, Kobo or Barnes and Noble. 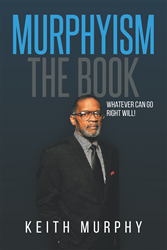 For additional information or inquiries about “Murphyism The Book: Whatever Can Go Right Will!”, contact the Christian Faith Publishing media department at 866-554-0919.